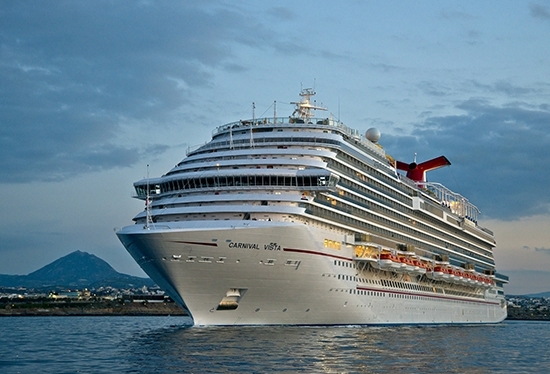 My family and I just returned from a 10-day cruise aboard the new Carnival Vista which started in Barcelona and ended in Athens. What an incredible experience sailing and eating my way through the Mediterranean. 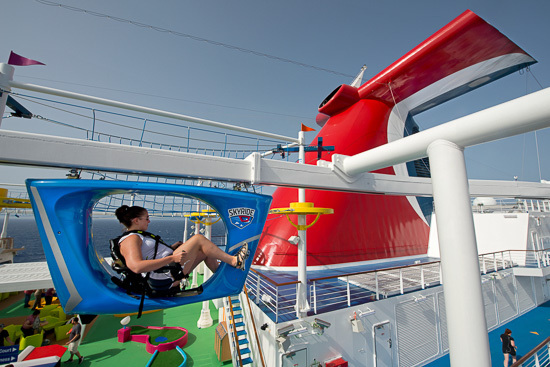 Like most people, gaining weight on a cruise is incredibly easy. 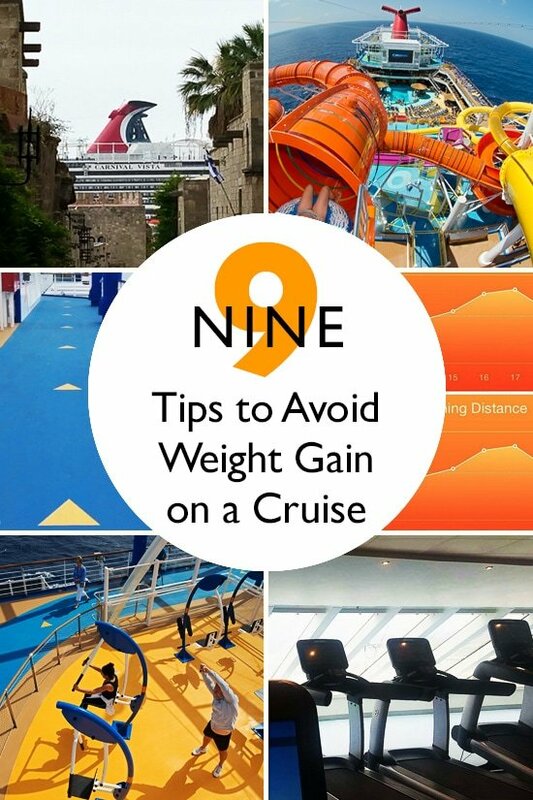 I put on 5 pounds during my first cruise a few years back and losing those pounds was a challenge so I made it my mission this time around not to repeat those mistakes and can happily report that my efforts were a success (I actually lost 1 pound!). 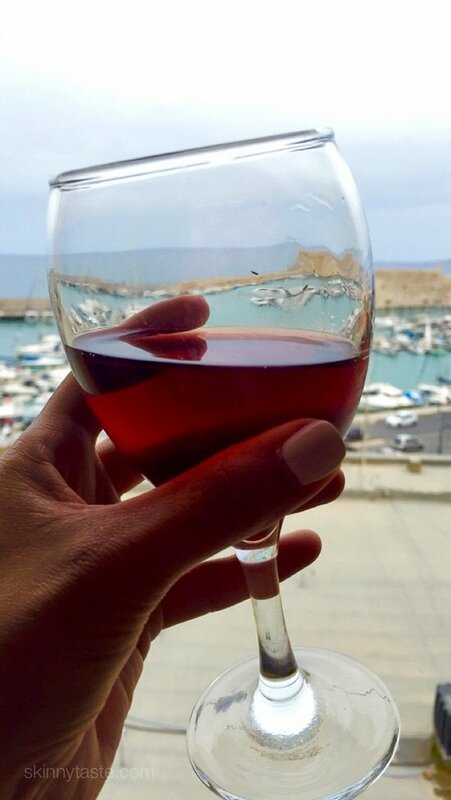 This doesn’t mean I sacrificed enjoying great meals and cocktails while on vacation, after all I was there to taste authentic European cuisine (yes, I ate mozzarella, gelato and pizza in Italy, wine and macarons in France, spinach pie in Greece, etc.) and have lots of fun. If avoiding the dreaded weight gain while cruising is a high priority for you I’ve created a few simple strategies to help you find balance as you navigate the abundant sea of buffets, restaurants and watering holes available during your cruise. There are certainly lots of temptation on a cruise – buffets, cocktails, dessert, pizza, cheeseburgers, ice cream, lava cake! But there are also tons of healthy options, so it’s about making the best choices and keeping your portions under control. The dining room on most cruise ships usually serves smaller portions, and may even offer a low calorie dessert option. Sharing dessert is also a great way to have a taste without overdoing it. 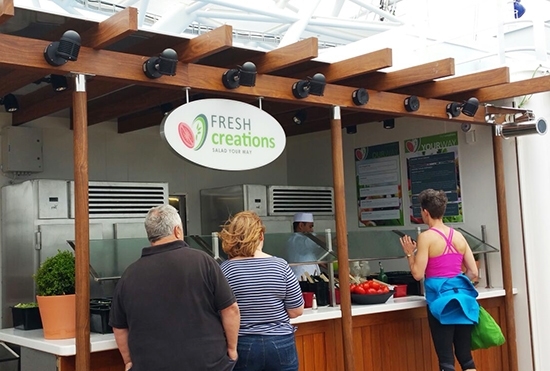 The buffets also offer plenty of healthier options such as carving stations, salad bars, fresh fruit, oatmeal and omelet stations, whole grain breads, eggs, vegetables, soups and more. Load up on salads, veggies, soup and lean proteins. Don’t rush through your meals, relax you’re on vacation! If you eat at a moderate pace while enjoying the company you are with, before you know it you will be full and satisfied and wont be as tempted to go back for seconds. 2. Eat off the spa menu. Rather than indulging in burgers and fries for lunch I opted for the salad bar. Many ships have a spa menu such as the Vista’s Serenity Salad Bar which had all the fixins such as a variety of fresh lettuce and herb options, quinoa, chia, veggies, etc. Yum! 3. 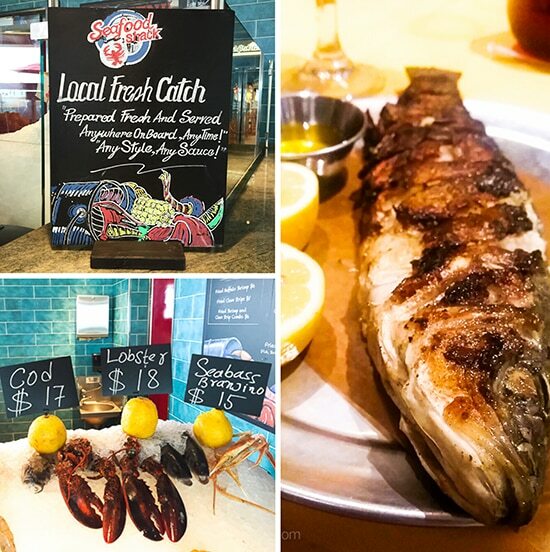 Eat fresh local seafood. Take advantage of the fresh fish and shellfish both on and off the ship whenever possible. This was easy to do on the Vista, in my travels in Greece at Rhodes and Crete, I ordered grilled octopus and grilled calamari at quaint restaurants. Back on board the ship, the dining room often offered a catch of the day from the Port of Call. Carnival’s Bonsai Restaurant has incredible sushi for a low price and new to the Vista, their Seafood Shack also offers the local catch of the day prepared fresh and served anywhere on board, anytime, any style, any sauce. My oldest daughter loves Bronzino so we ordered this earlier in the day (fresh from Naples) and it was prepared, grilled perfectly and conveniently sent to our dinner table. 4. Avoid the all-you-can-drink package and skip the sugary drinks. Cocktails are calorie-ridden and they add up quick. When you purchase the drink package, the mentality is that you need to get your money’s worth and chances are you’ll order a drink even if you don’t want one. Many cocktails, especially the umbrella drinks are loaded with sugar, fruit juice, creams, etc. Instead opt for a wine with dinner, and if you really want a pina colada, treat it more like a dessert and stick to just one. For those who love carbonated sugary sodas my husband says the best kept secret is simple….”Get the seltzer with fresh lemon”! All the effervescent, bubbly goodness without all the sugar. 5. Pack your sneakers and your gym clothes. Again, I do believe in balance so enjoying a cocktail or dessert with dinner isn’t the end of the world. Instead, hit the fitness center and work it out! 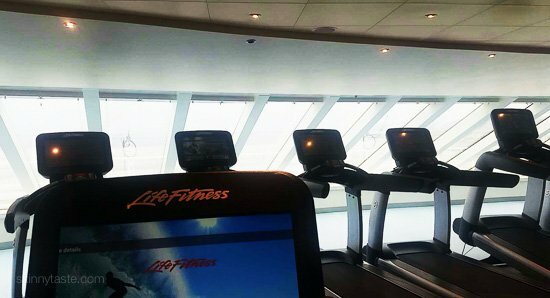 Where else can you work out while enjoying those beautiful ocean views while sweating off those calories. Take advantage of the on-board gyms and fitness centers. 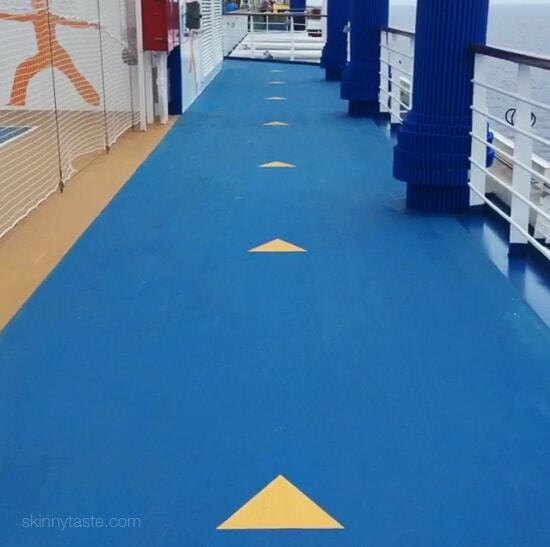 On most cruise ships you’ll find an outdoor track on the promenade deck where you can walk or jog laps. What can be better than a track with an ever changing ocean-view landscape! On the Carnival Vista, 7 laps around the track was equal to a mile. 7. Skip the elevator and take the stairs. I did a ton of walking on the ship in order to get from my room to the pool, spa, dining, kids camp, shows, comedy clubs, the bars, etc. front to back, bottom to the top. Taking the stairs whenever possible is a great way to get to your destination while burning some calories along the way. 8. 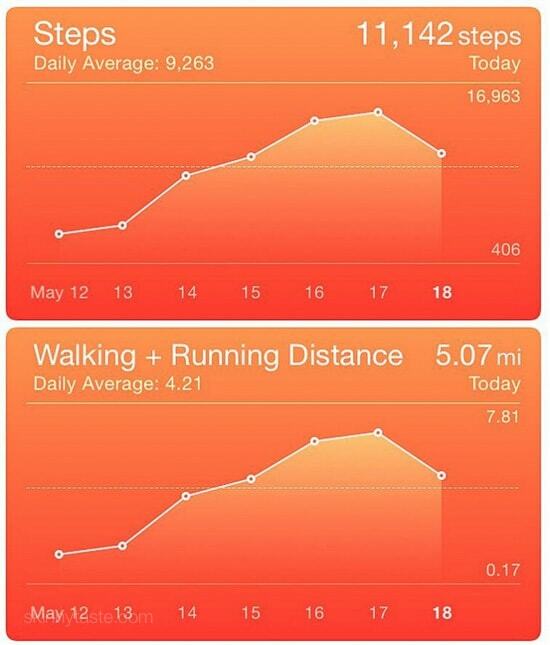 Track your steps and set a goal. Using a Fitbit, pedometer or a phone app that tracks your steps (my iPhone comes with a free Health App that does this) set a goal for yourself and stick to it. Traveling through Europe I did a ton of walking (especially in Rome), so take advantage of excursions that allow you to get in some exercise enjoying your destination. 9. Burning calories while having fun aboard. 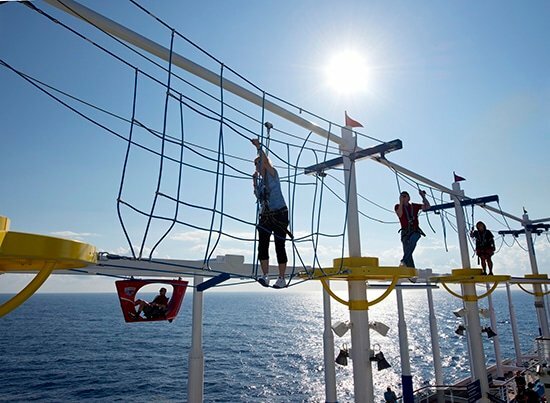 Ping pong, the sky course, the pool, sky ride, basketball, mini golf, the sport square – there’s so many ways to stay active while on board, take advantage of everything the ship has to offer and most of all don’t forget to have fun. Bon Voyage! I hope you find these tips useful for your next cruise! Have you been on a cruise? Do you have additional tips you can share on how you navigate the seas while watching your waistline? Disclosure: Carnival Cruise invited me as Press to experience their new ship, the Carnival Vista. Thank you for supporting the brands that make Skinnytaste possible. All thoughts are always my own.